Six round brilliant diamonds are channel set into the wide shoulders of this gorgeous tourmaline stone ring. Its shank crafted of 14k gold, is contoured to hug the fingers, and its geometric shape and size grant it unisex appeal. Crowned with a stunning 9.8-carat cabochon slice of Watermelon Tourmaline, witness a juicy cocktail ring fit for any occasion. 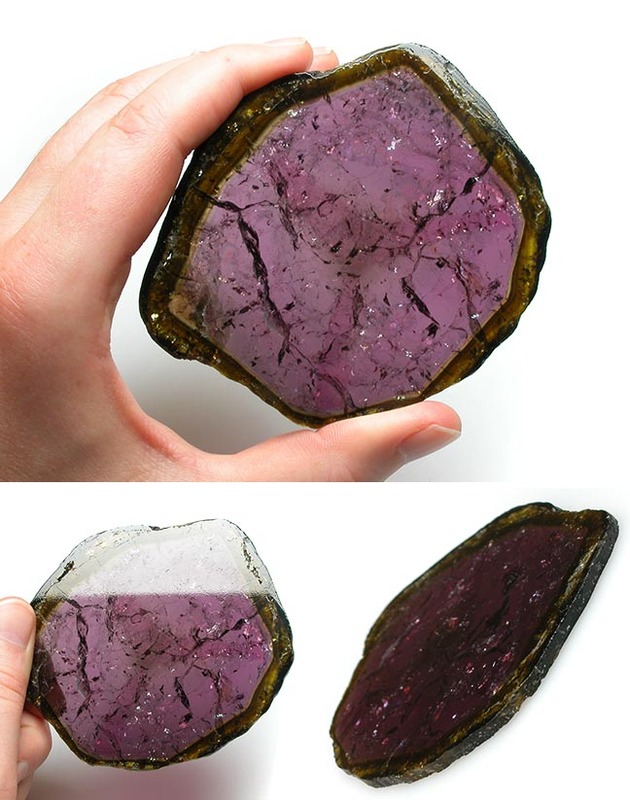 Watermelon tourmaline is the rarest form of elbaite tourmaline found in nature. Like all tourmaline varieties, it forms when magma is forcefully injected into hardened granite. As the hot viscous solution begins to cool, crystals form. For watermelon tourmaline to grow, this liquid syrup must be rich in sodium, lithium, aluminum, boron. In addition, atoms of chromium (red), vanadium (green), lithium (green, pink), and/or manganese (pink) must be present during growth. 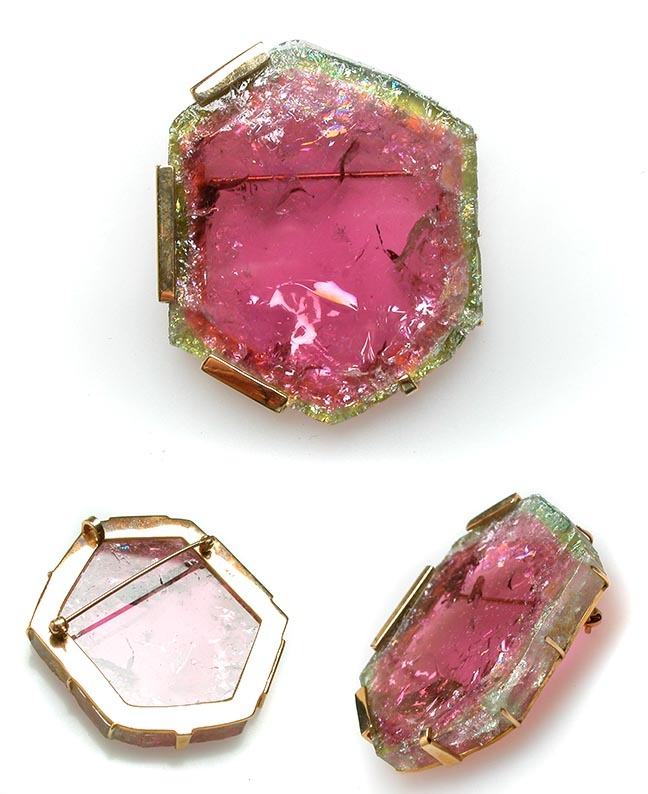 These chromophores fuse themselves just so into the lattice structure of the crystals, resulting in the layering of green, white, and red indicative of watermelon tourmaline. These beautiful stones are rare, and rarer still are specimens greater than 10 carats. Watermelon tourmaline is typically flecked with inclusions, but these only seem to add to their allure. 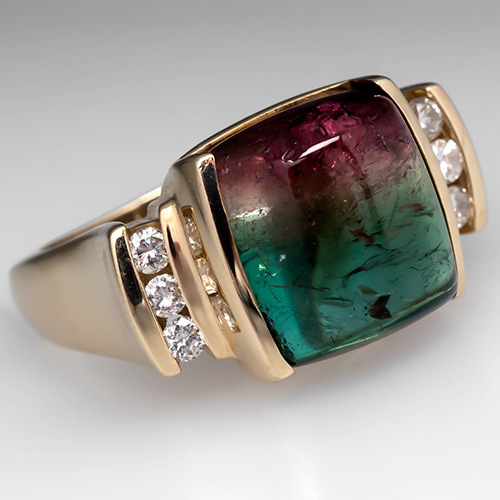 Depending on the precise crystal structure of the stone, tourmaline rates between 7 and 7.5 on the Mohs Scale of Mineral Hardness. 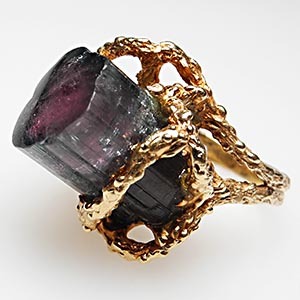 Experts agree that while tourmaline is fairly durable, it is wise to remove one before undertaking heavy labor, most especially if you'll be working in dirt. A fine grain of quartz or other harder mineral could scratch it, and the stone itself could crack or break under pressure. Experts further advise the avoidance of ultrasonic or steam cleaners. Rather, a soft brush with warm, soapy water is all that's required to maintain your stone's lustre. 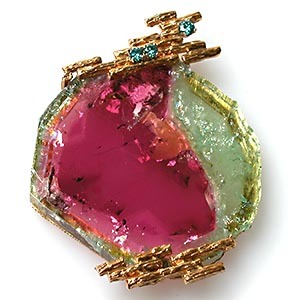 In addition to its unique play of color, watermelon tourmaline, like all tourmaline, is naturally piezoelectric, pyroelectric, and pleochroic. Piezoelectric stones become electrically charged when friction is applied, and pyroelectric stones become electrically charged when heated. Wear this stunning ring to the next party you attend. As your watermelon ring casts its enchanting spell, take note of how all eyes are on you. Smile big, and witness how magnetic you've suddenly become. Take a brief bow and whisper a word of thanks to your stone. You've just made some new friends.